The Gtechniq W4 Citrus Foam is a pre-wash foaming degreaser and shampoo, that will help you remove road grime with ease! When washing your vehicle, sometimes a simple car shampoo does not pack enough punch to safely remove nasty road grime, bug guts, and other contamination. If you are unfortunately in one of these situations, you will need something with more cleaning power. 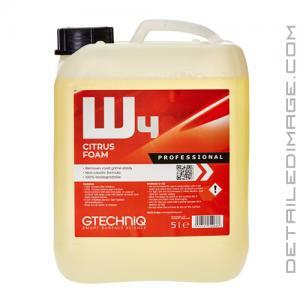 With the W4, Gtechniq combined an effective citrus degreaser with a strong foaming agent, which sprays onto the surface, clings to the area and encapsulates dirt and grime, lifting it from the paint safely and easily. This high-quality formula is pH neutral and does not damage any sealants, coatings or waxes you may have applied combined with a great citrus scent. To apply, you can use a Foam Lance, Foam Gun or pump sprayer or a traditional two bucket hand wash. There are many different dilution ratios (listed below) if you want to fine-tune the results and like most degreasers avoid direct sunlight and do not let the product dry on the surface. Following these basic guidelines, you can expect great cleaning results beyond the powers of normal soaps. Therefore if you want an exceptional cleaner the Gtechniq W4 is a great choice! Unlike traditional pre-wash snow foams that come loaded with caustic chemicals, W4 Citrus Foam is a pH neutral formula that removes hard to shift grime without damaging coatings. It combines an effective citrus degreaser, with a foaming agent, making it tough on road grime and bug splatter. It can be used at a dilution of up to 20:1 through a foam lance.